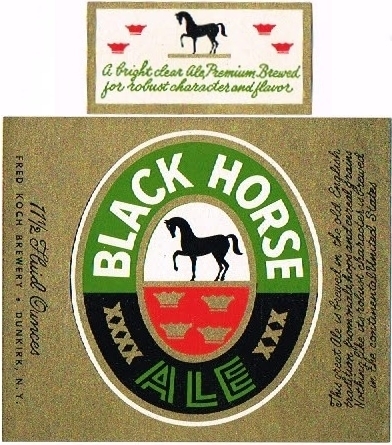 Is there anybody left in the business of Black horse ale? I have come across a painting from 1935 they might be interested in having…. Here is a late response to beers your question about my current beer preferences (June 20 post on Black Horse). I had a long-standing preference for Blue Point ESB and Pale Ale, usually bought in growlers from the brewery for bargain prices. (One of the original owners, Mark Burford, and I have been acquaintances since meeting in the 80s as homebrewers.) Now neither beer is regularly available, so I am casting about for a new favorite. Montauk driftwood tastes good. I like Brooklyn Pilsener and Founders Porter. I also like Great Lakes lagers (Eliot Ness, for example) but distribution in this area has been ended. I also have a comment regarding the geographic split of brands, similar to Black Horse. Atlantic of Chicago and Spokane, Washington marketed Bohemian Club. They dealt the brand in the northwest to Blitz-Weinhard, but sold the midwestern rights separately, ending up with Huber. These were different beers with different labels. The Blitz (Brewing Co. of Oregon) version was notably cheap and bland (I drank some of this in the early 70s). 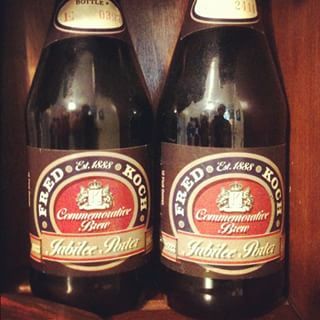 In the late 70s, the Huber version was OK, being on the malty side, similar (or identical) to the main Huber brand. Thanks Arnold, very helpful. The Montauk Driftwood is great, I know it well, I like it not too chilled. Very English-styled. I know some of the others you mentioned too, all certainly good. Interesting about differences in brands dealt out as you said to different brewers, I’ve noticed that too in other contexts. 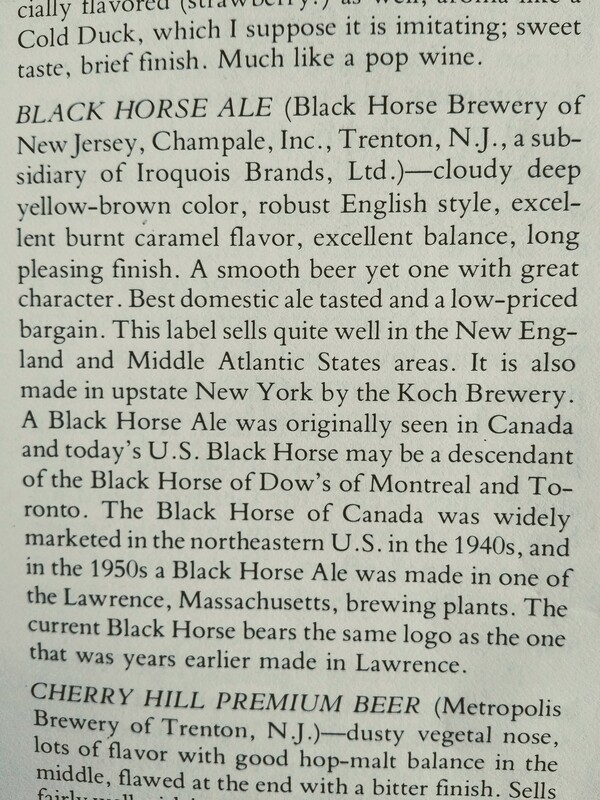 Our local bar in Mastic on Long Island stocked bottles of Champale’s Black Horse Ale in the late 70’s. I drank a bit of Champale’s Black Horse there, usually with an Italian style dinner, and at home when I could find it at the beer store. I recall that it had a fairly full body with possibly some unusual “off” flavors that didn’t spoil the drinking experience. My personal preference was McSorleys Ale (then brewed by Ortlieb), which I thought was excellent (nothing like the current product). At the time, I also liked the combination of low price and good quality of Yuengling Lord Chesterfield, which also may have gone downhill since then. Thanks for this, I agree Lord Chesterfield was very good with a notably hoppy odor and taste, I think it has gone downhill since then. I never had McSorley’s when it was any good, it was made by Fidelio brewery in the 30s and was said to be a stock ale, an old-style ale with some aging. Do you still like beer, what do you drink now? Thanks for doing all that research. I remember both the Koch and Champale versions with some fondness. They were outliers of interesting taste in that pre micro brew era of homogeneous blandness. Koch made another ale, Deer Run of which I have no memory, and a rich malty seasonal lager, Koch’s Holiday, during the holiday season. To a 20 something budding beer fan these were fascinating finds. That and crossing the river to Ft Erie and exploring the mysteries of the Brewer’s Retail. I wonder what might have been possible if Koch had been able to hold on for just a few more years. Keep up the good writing.